Dweebies are small round creatures. 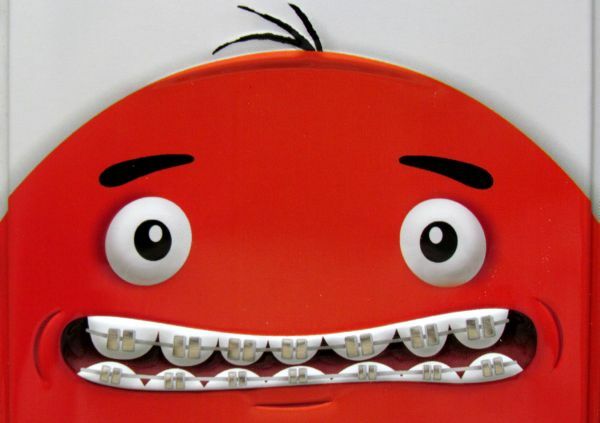 They have two arms and two legs, just like us and they are similar also with many other body proportions. Nevertheless, one major difference can be recognized at first glance, when you meet one of them. But it will not happen out there on the street. Dweebies are, in reality, only about the size of a mouse and they are very carefully hidden inside holes in the field. They live in their underground world, where no one knows about of them. And even we had no idea about their existence, just until recently. They have round little bodies and their head is connected directly to the neck. Every good dweebie has one big hobby and when you look up at him closely, you will see, that they have only three hair on their head. But much more significant is their skin color, which always bears a striking shade of some merry color. It is the perfect choice for their great and always optimistic mood. But what is most interesting, is the fact, that dweebies are born and live in groups. Each dweebie has one or more twins, which look and behave exactly like him. Reason for this is hidden in their playful nature, because the time spend alone is not for playful creatures. And a dweebie, who does not play, is a sad dweebie, believe us that. 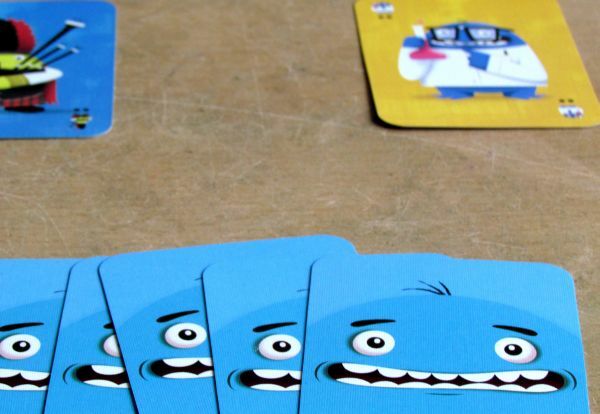 And that’s why the GameWright company and author Tim Roediger took into their heads, that they will create a world for them in this little card game. All dweebies become stood as models for game illustrator Christopher Lee. And because dweebies in front of him with their hobby equipment, thešy each have some colorful clothes and weird hobby costumes. 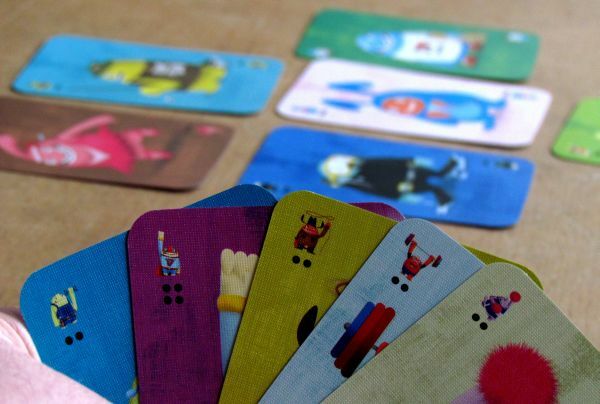 The game originates in 2010 and is part of small card games series, which includes such popular Sleeping Queens. 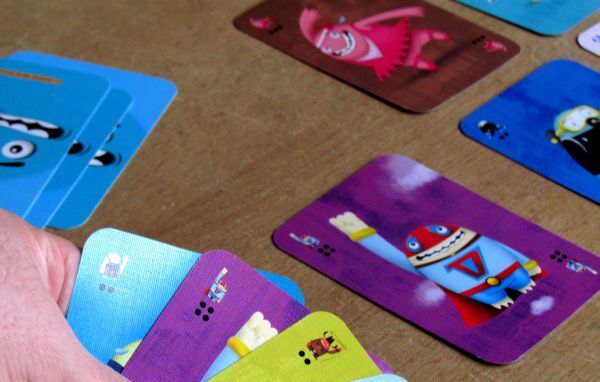 We have already published GUBS (review), who belongs to the same type and we have to repeat it now again – guys from GameWright get endowed with a pleasant thing – a metal box. 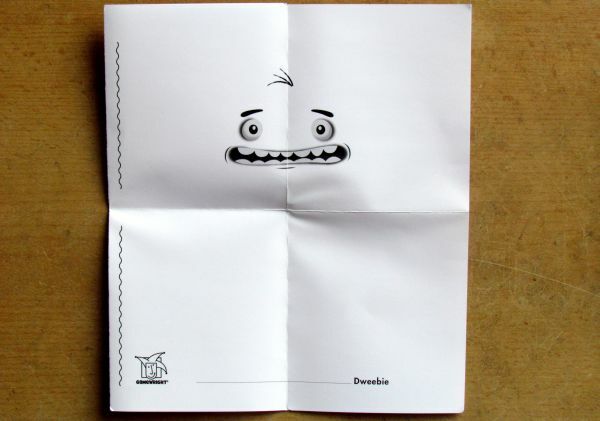 On the lid, there is a dweebie head drawn and you simply can not resist to its expression. 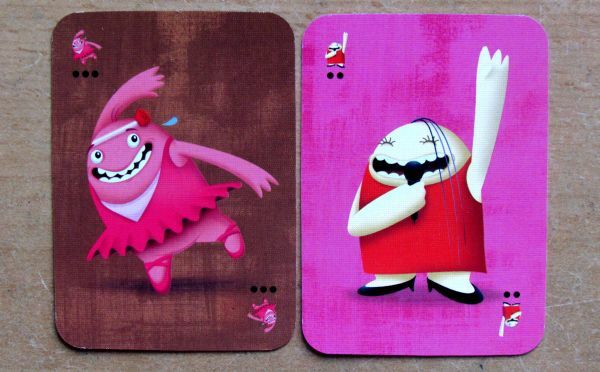 When the lid lifts up, there are 54 cards waiting for you inside plastic insert – dweebie portraits. In reality, however, there were often twins or triplets standing as model for game illustrator, so they seem as indistinguishable to you. So it looks like artist had less work, but its not true. Actually, however, these are siblings, who look exactly the same and each was drawn with the same perfection. 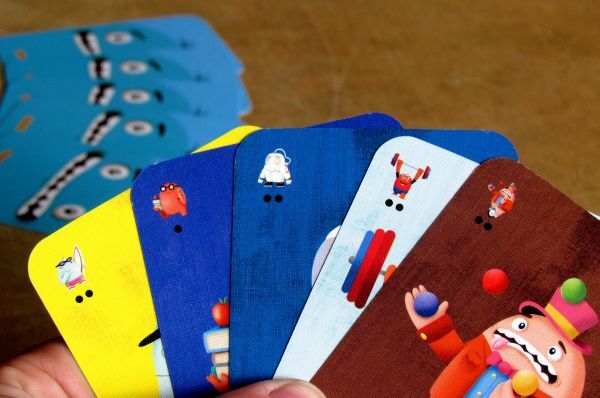 A first look at the cards bring joy to all parents of non-English speaking countries. 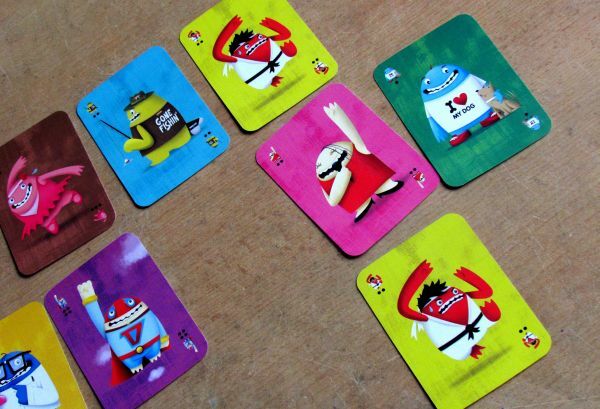 Card are not wearing any text, which makes them very suitable for family fun around the world! In addition to this exploration, whole game has very simple rules, although you get only English version inside the box. Each of these dweebies is different and has a different colored background. Siblings, however, have the same color, so you will find them easily and put them back together as they belong. 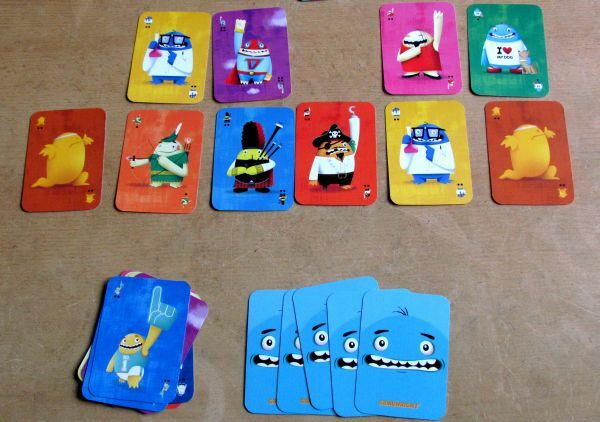 This is one thing, you will be interested in, while playing this card game. In the upper left and lower right corner of the portrait, there is a portrait once more in much much smaller version, so you can easily see, which dweebie this is, even if you hold the card in hands. Beneath this little picture, there is a series of dots telling you, how many times is this dweebie portrait present inside the deck. Some have more siblings than others. 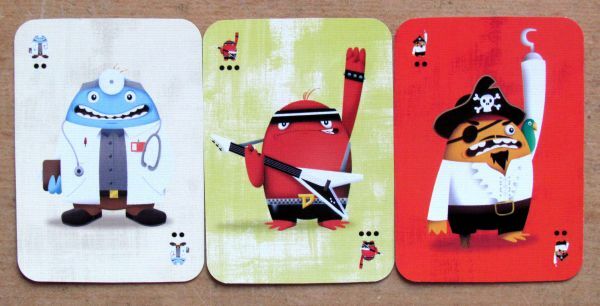 Maximum is four identically looking siblings, but with some dweebies, their siblings did not come to the photographer, so they are all alone among the cards – just like green archer Robin Dwood. But with Dweeberman and his red hood, there were all four siblings in the studio. You always know the number of portraits, when you look at dots in the corner. 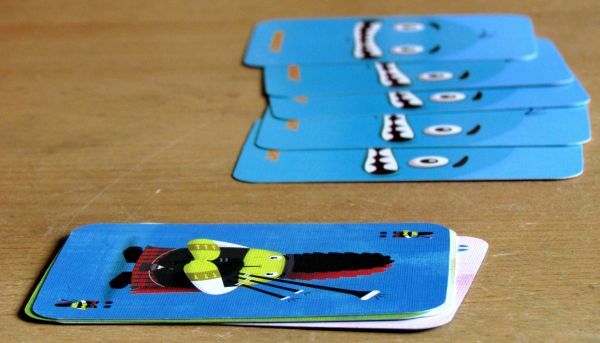 Shuffle the whole deck of cards and deal five of them to each of the players. These are his starting mates, for whom he must find at least one twin. 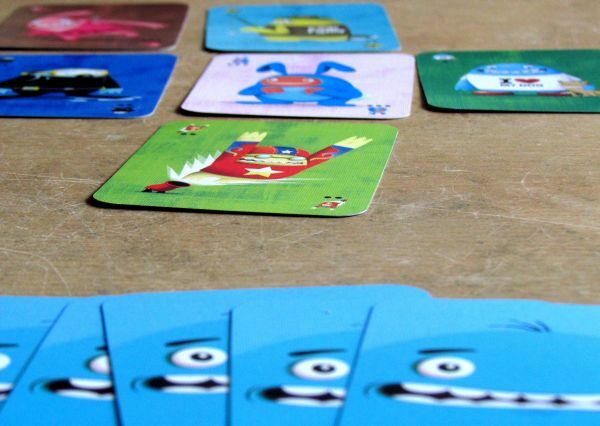 All other remaining cards form a pile on the table. 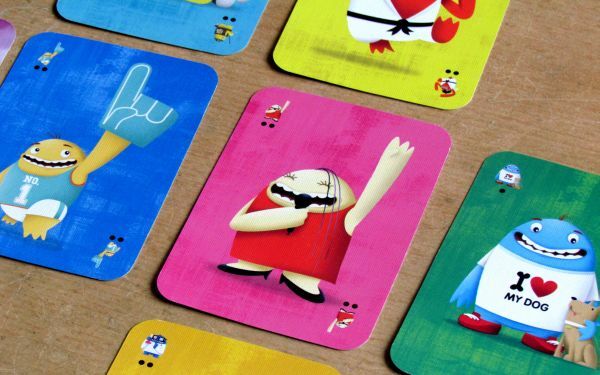 Players will gradually pick card from there as a replacement for played dweebies. 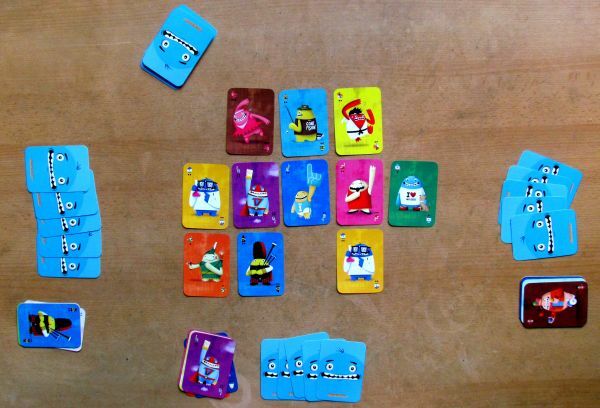 Each player turn is composed of three phases, but only the first and last are really required in each round. 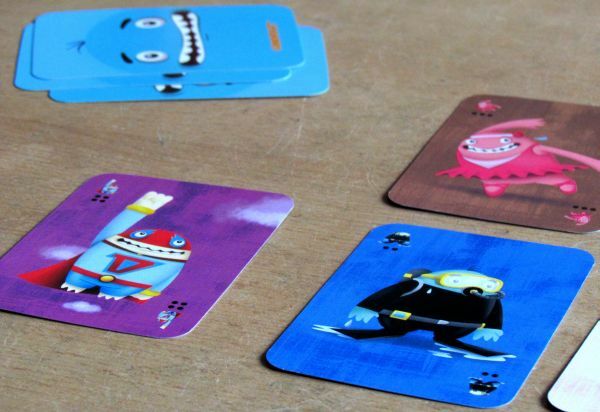 First, the player must play one colorful dweebie card on the table. 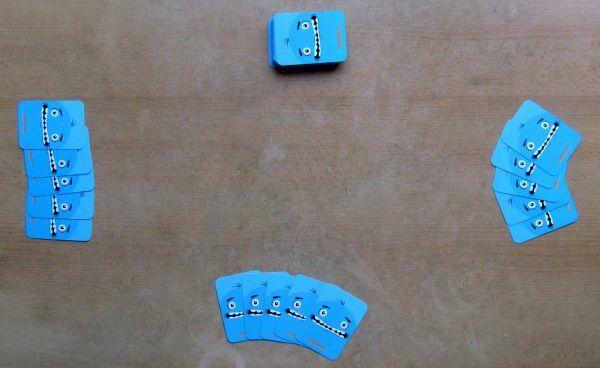 By playing cards, players gradually form a grid of cards adjacent horizontally and vertically. Most of these are portraits of different dweebies. But your goal is to find a simbling to an already played creature, with the same card coloring and identical picture. And its not that simple. You are always interested only in such dweebies, who lie at the edge of the entire group. Placing their twin makes you score not only those cards, but also all cards, which between them. Both cards must be in line (horizontal or vertical) and have to be at the end of this line. So you can pick not only those two dweebies, but all their friends in their line. This is the second, optional part of the turn, because you will not be able to make such move each round. But then gaps between cards begin to emerge. If dweebies are divided into groups, their social nature makes a call. From now on, players are not able to collect more points, until these groups are brought back together. You must therefore play cards without a claim for reward, until these social creatures are once again brought together. 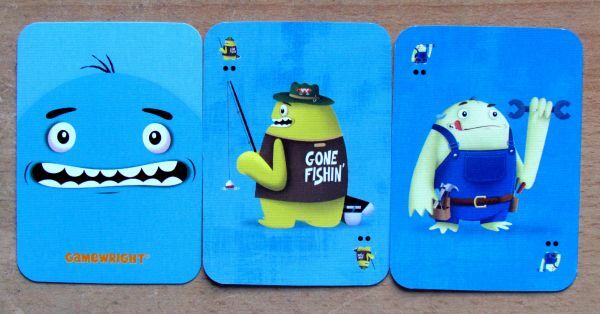 Despite the gaps in their ranks, which do not separate cards in groups, you can collect dweebies. Additionally, if this gap is only one space wide, placing a dweebie there will not allow you to take cards. He will have neighbours on his right and left side, so he is no longer an ending portrait of the line. At the end of his turn, a player draws a card from the common deck, so that the has back the starting number of five cards. The game ends as soon as the supply of dweebie portraits runs out, because most of them have you already collected. Once the players run out of cards in hand, they all count accumulated pictures and the player with the largest collection of cards wins. We will not be pulling the long leg. 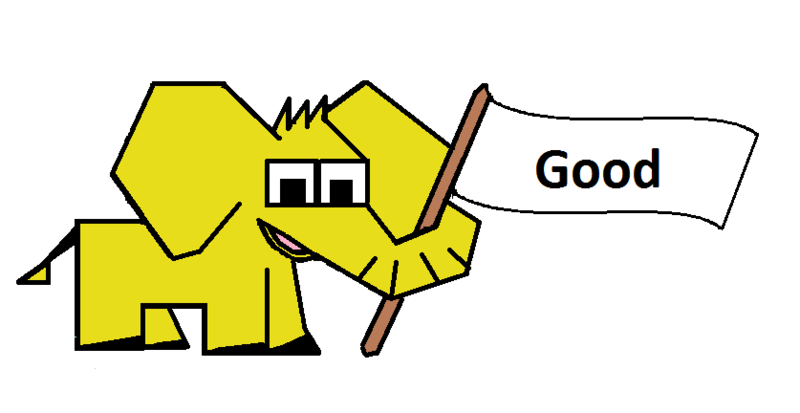 Dweebies is a wonderful game for all children. There is not doubt about it. They quickly pick this game up and it will be a tremendous fun for them. It’s fast, looks nice and dweebies instantly become best friends of all. However, there remains some strategy in the game, despite the seeming simplicity. First of all, players can always choose a place, where to put their card. 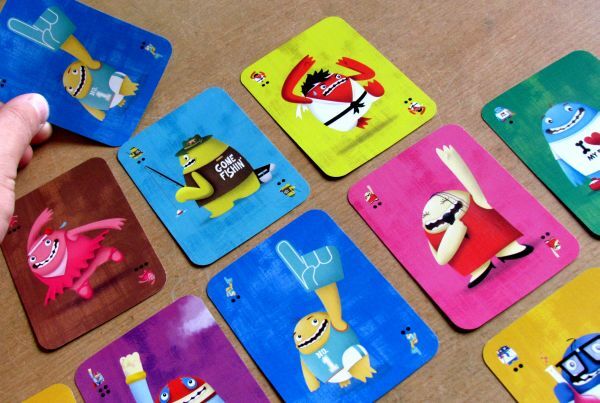 If you want to play tactically, it is important to have an overview, which dweebie cards are already collected. 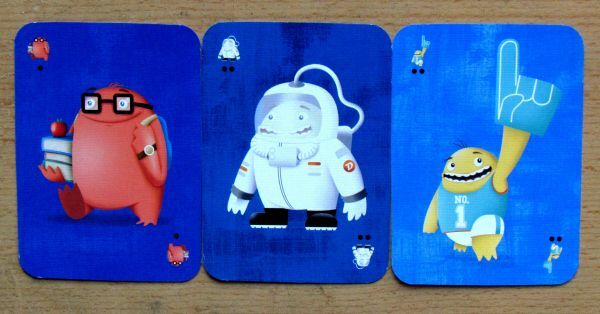 These cards are not the ones you would like to keep in your hands. You have to have at least one dweebie sibling in the drawing deck (or opponents hands) and therefore you will still have a chance to get points for him. Often you will encounter a pair of identical dweebies in your hands. Such series and almost certain points can be easily ruined by your rivals. They only have to lay another card beside your dweebie, thus he ceases to be the edge card. And before you get back to move to complete your intention, you are often confronted with moment of tension. If you suceed in such serie, it is usually worth a big lump of points. You simply casually put cards on one side of loooong row and wait. Because different dweebies are present in different numbers in the deck, the ones with more in number, are also those larger in importance. But you also need to think about the chance, that second dweebie for your plans can be in your rival hand! The whole game is tremendously fast and it does not matter, how many players participate in it. All the time of the match, it is great fun not only for children. Although adults do not consider this a card game for a big challenge with deep thinking, it serves perfectly as relaxation with children. Graphic designer has chosen exquisite colors for the background, they are sufficiently different and easily recognizable. That’s good, because the game remains clear even, when the table is full of dweebie cards. Orientation among cards is very important and game will sharpen those skills. Children can also learn to recognize the less traditional shades like this. 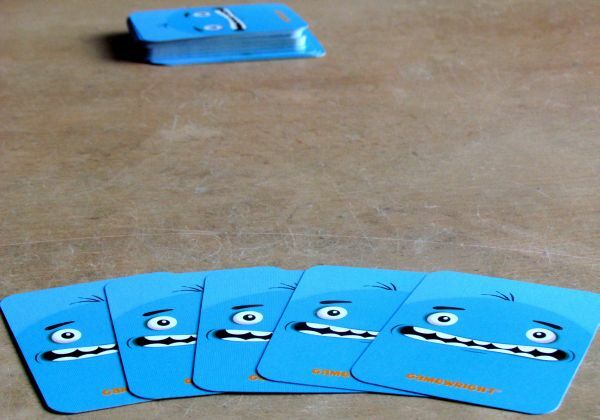 Dweebies is a card game for kids. They can handle it without problems since the sixth year of age. There is no text on the cards, so you can just watch colors and images. 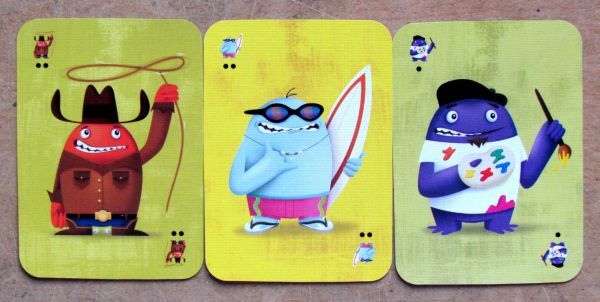 In addition, the illustrations are amazingly cute and every young player finds his favorite character among them. So do not be shy and welcome new friends to your family. Their name is Dweebies and everyone likes them! 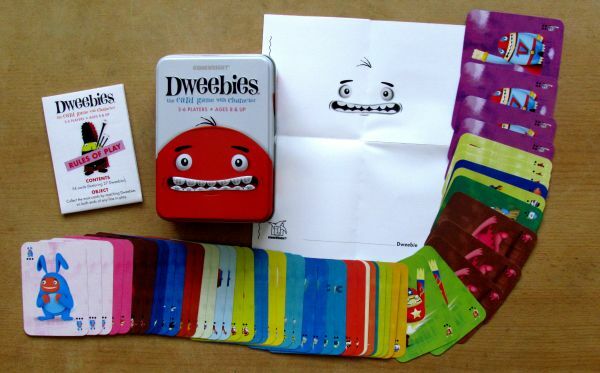 Dweebies is a card game, which is perfect present for every child under his christmas tree. It allows him to have lots of fun with his parents, while playing. And therefore, you will make your children happy, even if you buy it another time. 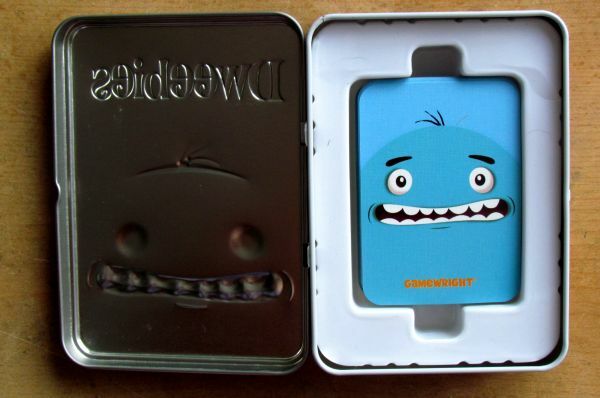 There are cute monsters hiding inside the metal box and they make you laugh. You are trying to make lines, which start and end with the same character. In that situation, you get to pick up the whole line and score it for points. Game has really easy principle, but is still entertaining and quick. Yes, it is often decided by chance, but that is compensated with a fact, that you will not find here any alphabet letter. Game is suitable for children even in preschool age from five and for small players all around the world without exception. 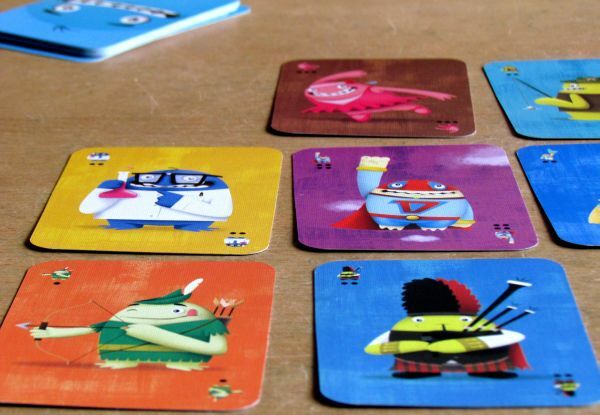 Beautiful illustrations and family fun make Dweebies an excellent buy for any parent..